Size 47" x 8" x 3/4" 62" x 10" x 3/4" 78" x 13" x 3/4" 78" x 13" x 1" 47" x 9" x 3/4" 60" x 12" x 3/4" 75" x 15" x 3/4" 75" x 15" x 1" 45" x 11" x 3/4" 58" x 14" x 3/4" 70" x 17" x 3/4" 70" x 17" x 1" 44" x 12" x 3/4" 56" x 15" x 3/4" 68" x 18" x 3/4" 68" x 18" x 1" 43" x 14" x 3/4" 54" x 17" x 3/4" 65" x 20" x 3/4" 65" x 20" x 1" 42" x 15" x 3/4" 52" x 18" x 3/4" 64" x 22" x 3/4" 64" x 22" x 1" 38" x 16" x 3/4" 50" x 19" x 3/4" 62" x 24" x 3/4" 62" x 24" x 1" 36" x 16" x 3/4" 47" x 20" x 3/4" 60" x 26" x 3/4" 60" x 26" x 1" 36" x 17" x 3/4" 46" x 22" x 3/4" 57" x 27" x 3/4" 57" x 27" x 1"
For specific size variants according to pitch, please review the Sol Nuevo Royale Size Chart. The Sol Nuevo Royale vinyl gable bracket is from our Coastal Cottage Collection which contains other products with similar beach and nautical looks. 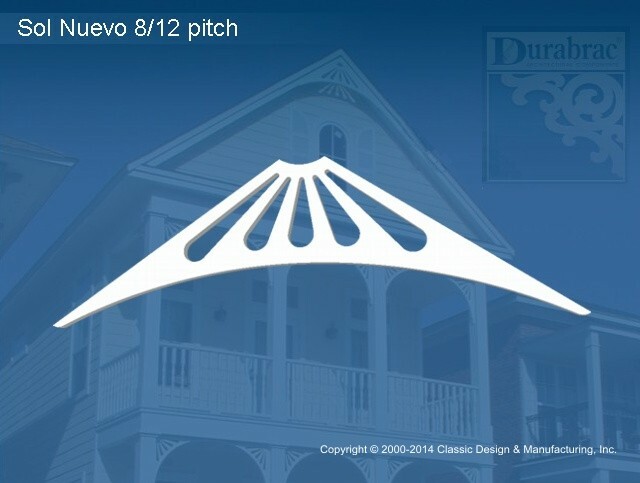 All Durabrac components are made of 100% virgin vinyl and may be left natural white or painted with latex paint. A painted finish will not check, crack or peel. For details on sizing, roof pitch calculation, installation and painting, please refer to the Related Documents section on the Gable Bracket main page or in the Product Support section in Customer Support. ** Returns are not accepted on gable brackets. Please triple check pitch and size to ensure the correct size is ordered.